from Wilson, Iris Higbie (1965), William Wolfskill, 1798-1866 : Frontier Trapper to California Ranchero, published by Arthur H. Clarke Co., Glendale, Calif. p. 22. "[Joseph Wolfskill was a] German farmer from the Pennsylvania country.3 ... As the youngest of seven brothers who, because of their height and physical fitness, had been impressed into the service of Frederick the Great as members of his famous Potsdam regiment, Joseph Wolfskill to America in 1742 to escape similar duty in the King's guard. This story, which had been passed down through the Wolfskill family, was substantiated when a Doctor William Wolfskehl* of Germany arrived in San Francisco via Australia, on this return home to Germany in 1870, and later when his son came from Berlin to inspect the Northen Pacific Railroad. Dr. Wolfskehl stated that his grandfather was one of the seven brothers of whom Frederick the Great had impressed six into his Potsdam regiment of tall men and that his grandfather was the only one of the six that escaped from the wars, leaving the Wolfskehls of Germany as his descendants. Dr. Wolfskehl said further the seventh and youngest brother had come to America, and both the doctor and his son believed that the Wolfskills of Kentucky and later California were descendants of this youngest brother.4"
3 U.S. Census 179 of Franklin County, Pennsylvania, in Pennsylvania Archives, 5th Series, VI, p. 119. 4 James M. Guinn, A History of California and an Extended History of Los Angeles and Environs (Los Angeles, 1915), II, p. 24. * William Ernest "Doctor" Wolfskehl (1838-1937) was born on June 8, 1838 in Darmstadt, Hesse, Germany to parents Seligmann Wolfskehl (1806-1862) and Elizabeth "Betty" Baum (1810-1890). He came from a long line of German-Jewish ancestors in Darmstadt who descend from a Jewish cattle dealer named Jehuda Löb Wolfskehl, whose forebearers came from the village of Wolfskehlen (today a suburb of Riedstadt) and resettled in Darmstadt in the aftermath of the Thirty Years War (1618-1648). William "Doctor" Wolfskehl left Germany in 1865 and emigrated to Australia, where he became an Australian citizen on July 8, 1865 in New South Wales. His naturalization papers give his occupation as a Doctor of Medicine, though their seems to be no independant verification that he actually held a medical degree. He married Margaret Emma Bird (1840-1911) on Oct. 26, 1865 in Australia, probably in Kew, New South Wales, where he and Margaret generally resided over the years. William and Margaret later appear in the 1881 U.K. Census with their family at an address in Lambeth, London. They had four children, two born in Australia and two in London - Augustus Siegfried (1868-1949), Theodore (1869-1944), Trophina (1874-1945) and Harold (1871-1971). The oldest son Siegfried is known to have made a trip in 1934 on the ocean liner Aquitania to the United States. Although William generally referred to himself as "Dr. Wolfskehl", he gave his occupation when in London as a Foreign Merchants Agent. However, he had a less than stellar reputation back in Australia, where he was involved in the late 1860s in a celebrated court case that resulted in his being considered there something of a con artist. He died on February 9, 1907 when 68 years old during a visit back to his birth place in Darmstadt. He is a distant cousin of the German-Jewish poet Karl Wolfskehl (1869-1948), mathematician Paul Wolfskehl (1856-1906), and civil engineer Edouard Wolfskehl (1874-1943) all of whom were also born in Darmstadt. The ancestry of this family is summarized by Klause Barner (1997), "Paul Wolfskehl and the Wolfskehl Prize", Notices of the AMS, American Mathematical Society, v. 44, n. 10 (November), p. 1294-1303. It may in fact be Edouard Wolfskehl, and not one of William Wolskehl's sons who is mentioned in the preceding story by Wilson (1965) as coming to California to inspect the Northern Pacific Railroad, as Edouard's carrer was focused on the railroads in Germany. A more complete ancestry of the Wolfskehl family of Darmstadt is by Eckhart G. Franz (1984), Juden als Darmstädter Bürger (Jews as Darmstadt Citizens), Published in German by Eduard Roether, Darmstadt, 444 p. A family tree in English is available on the Wolskel/Haeberlin Web Site on MyHeritage. Last accessed on 13 Aug 2018. William Wolfskill was born in Boonesborough 20 March 1798. His parents were Joseph Wolfskill, Jr. and Sarah Reid, who were married in Madison County 20 July 1796. Sarah was the daughter of John Reid, and Joseph, Jr. was the son of German immigrant Joseph Wolfskill and his wife Margaret Smith. Joseph and Margaret's other children were Margaret, George, Peter, and William. According to family tradition, Joseph, Sr. came to America in 1742 to escape impression into the service of Frederick the Great. After spending about 25 years in Pennsylvania, the Wolfskill family moved to Rowan County, North Carolina. They remained there until about 1788 when they moved to Madison County, Kentucky. Joseph and his family settled near the mouth of Silver Creek. In 1805 Joseph posted a notice in the "Kentucky Gazette" (a Lexington paper, as there were no papers published in Richmond) that his wife Margaret had left him and he was not responsible for her debts. Joseph, Sr.'s son, William, died in Madison County in 1796. His widow Jane married John Heard 20 June 1797. Joseph (the records do not specify a Jr. or Sr.) was guardian for the children of william and Jane, but these children were never named. Joseph, Sr. died in Madison County about 1819. From Couture, Jackie (1998), "William Wolfskill Kentucky Trapper" in Madison County Connections, published by the Madison County (Kentucky) Historical Society, v. 2, n. 2, p. 2-3. From the Sacramento Daily Union, v. 2, n. 38, February 8, 1891, p. 9. Assemblyman From the Twenty-Ninth District, Solano County. Mr. Wolfskill was born in Howard County, Missouri, in 1843. He came to California in 1850 and located on Putah Creek, Solano County, near the present town of Winters, in l852-53. During the summer seasons he improved the opportunity to attend the public schools and store his mind with knowledge. Like most pioneer youths, he had to labor hard,and thus the more appreciated the advantages of education and the true worth of labor, ln September, 1853, he went to Los Angeles and attended a private school conducted by his uncle, and remained there until the year 1858, when he returned to Solano County,and was in his old home until early in 1865. His father then sold the farm to Theodore Winters, the well-known stock-raiser, and the family went down to Los Angeles. In 1866 Mr. Wolfskill returned once more to Solano and purchased valuable land in Suisun Valley, where he has since maintained his home and prosecuted the cultivation of tbe soil. Mr. Wolfskill has not before filled any public office. His ambitions have not been in that direction, but he has taken a reasonably active part in the councils of the Democratic party, and has served it upon its Central Committees for some fifteen years. He has also been a delegate to nearly all the State Conventions of that party that have been held since he was old enough to take political action. He was also honored with a seat in tho Democratic National Convention of 1872, which placed Horace Greeley In nomination for the Presidency. His wife is a Native Daughter of the Golden West, and they have one child. Mr. Wolfskill's uncle was the first white man to settle in Solano County, and the Assemblyman's father is still living and a resident of the State. Mr. Wolfskill is one of the best informed farmers in the State. He is a man of practical knowledge, liberal views, sincere devotion to his adopted State, and enjoys the respect and esteem of his entire community. As a legislator he is diligent, watchful and conscientious, and his judgment commands attention and respect from his fellow members. From "Passing of the California Pioneer", The Grissly Bear, Native Sons of the Golden West, v. 26, n. 1 (November 1914), p. 22. Colonel Joseph C. Wolfskill, who crossed the plains to California with his parents in 1850, died September 28th, near Suisun. The family first settled on Putah Creek, near Winters, but in 1886 took up their permanent residence in Suisun Valley. In 1889, deceased was wedded to Miss Mary Blake, daughter of Alexander Blake, a pioneer of 1850, who, with three children, survives. Wolfskill was a native of Missouri, aged nearly 71 years, and at one time was a member of the California Legislature. The name ‘‘Wolfskill’’ is identified with the earliest settlement of California. Joseph Wolfskill, a Kentuckian, was the founder of the family. He left five sons, as follows, who located in California: William Wolfskill, located in San Bernardino in 1831, died in Los Angeles 1886; John Reed Wolfskill, located in San Bernardino in 1838, died at Winters in 1897; Milton Wolfskill, located in Winters in 1849, died in Los Angeles in 1909; Sarshel C. Wolfskill, located in Winters in 1850, died in Winters 1887; Mathius Wolfskill (deceased’s father), located near Winters 1850, died in Suisun, 1891.
and available on the Solano Community Foundation website. There’s a plot at Rockville Cemetery, where four large slabs of smooth concrete lie peacefully near the paved road, and where the story of Leslie Anderson, whose name is on one of the slabs, remains alive. Born in 1894, raised in Green Valley, and married to Virginia May, Anderson ran about 1500 head of steer in the feedlot on Morrison Lane. Locals say he even owned more cattle that grazed on Anderson Hills - the stretch of land owned by the rancher that ran from Suisun Valley to Green Valley, north of Rockville Hills Park. Anderson was known as a western guy to those around him, standing slightly over 6-feet-tall, donning a Stetson and packing a pistol in the likelihood of spotting a rattlesnake. 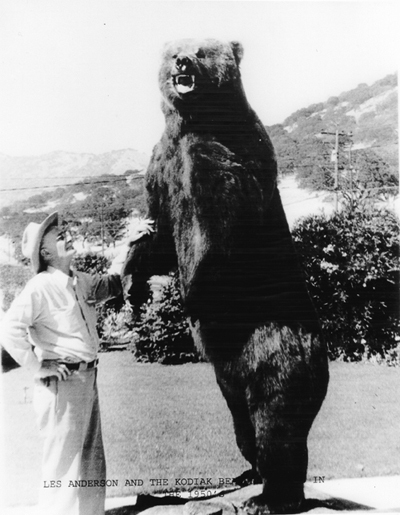 But he was a hunter at heart, even killed an Alaska Kodiak bear in 1958 - an 11-foot behemoth that stood mightily on his living room floor until the day the Andersons passed away. Some folks say that Anderson had his house remodeled to accommodate the bear’s height. No doubt, this enormous trophy was cause for celebration, which he did with more than two dozen men at Rockville Corners Restaurant, now called Rockville Inn. And it’s here, in this pub, where Anderson was a frequent patron, drinking Black and White scotch and shooting dice with his good friend Clarence “Judge” Wolfskill, the man who now occupies one of the spaces next to him. “Les and Judge were here (at Rockville), shaking dice, when they said, ‘We gotta buy plots at Rockville Cemetery.’ So they shook dice for the plots and all the cement work around it for both Les, Judge and their wives. Dad won and Les had to pay for everything. Everything. My dad was lucky,” recalled Dolores Russell, Wolfskill’s daughter, while sitting inside the very bar where the wager was made. Russell, a spunky woman in her 70s with hair as white as the pearls around her neck, was one of three couples inside the tavern on this early Friday evening, a ritual they’ve kept up for decades. All knew of Anderson and some, like Ken Kinnaman, could tell a story of the man like it just happened yesterday. But Les was more than a rancher. For many, he was a generous man, a philanthropist during his time, and basically, a “hell of a nice guy,” as Kinnaman remarked fondly. Bob Dittmer, an 88-year-old resident of Green Valley, whose grandfather purchased the land in 1881 that Dittmer lives now on, also remembers Anderson as being a charitable man. Anderson, a decorated World War I veteran, and his wife lived in Green Valley until their deaths in 1975 and 1989, respectively. In 1969, however, this childless couple established a charitable trust in their estate plan and by 1989, the trust was endowed with nearly $500,000. The Leslie and Virginia May Anderson Trust, then overseen by Jim Droast of Anderson, Smith, Droast and Connelly, required the trustee to place flowers on their gravesite three times a year. Jim’s wife, 83-year-old Alice Droast, today remembers the many trips to Rockville Cemetery with her husband as they fulfilled their obligations, never once missing an occasion. “The Andersons wanted flowers placed on their site every Easter, Memorial Day and Christmas. And we did it,” she said. By 1996, after Jim Droast passed away and the firm name changed to Anderson & Associates (no relation to Les or Virginia May Anderson), the trusteeship was transferred to Vacaville resident Becky Gardiner, a partner of the CPA firm. Gardiner, wanting to preserve Anderson’s philanthropic ideals, approached her partners in 2002 and suggested the firm open a fund at Solano Community Foundation with the fees collected from the trusteeship. All agreed. “The Leslie and Virginia May Anderson Fund was created for charitable purposes and I didn’t want any of it. It’s for charity,” Gardiner said. Teresa Fitzgerald, a partner at the Vacaville location of Anderson & Association, agreed. The Anderson & Associates CPA Endowment Fund started making grants in 2006 and to date, has granted almost $5,000 to local nonprofits. In 2007, Anderson & Associates decided to transfer the Leslie and Virginia May Anderson Trusteeship and assets of the fund to Solano Community Foundation, which by then had grown to $2.3 million. Since Virginia May’s death in 1989, the Anderson Fund has generated more than $2 million in grants, with funds going to local nonprofits such as Vacaville’s NorthBay Healthcare and the Elks Lodge of Vacaville and Fairfield. It’s Anderson’s way of continuing his legacy and fulfilling a commitment to the community, now and in perpetuity. You’ll still find fresh flowers at the Anderson gravesite three times a year, as requested by the couple [Leslie and Virginia May Anderson], placed either by Gardiner or a member of Solano Community Foundation. And as for the enormous bear that Anderson shot, well, Alice Droast says she knows what happened to the beast.